How does the temperature of a stream vary? Water temperature follows a pattern similar to that of the air. It also has a yearly cycle, with a maximum in summer and a minimum in winter. And a daily cycle overlays the annual cycle. The daily high generally comes in the afternoon and the lowest temperatures shortly after sunrise. Nevertheless, these oscillations differ from those of the air temperature in two ways. Their amplitude is smaller. Water cools and heats up less than air. So water temperature cycles lag behind the air temperature cycles. There's a well-known rule that says the best time of the day for fishing is when the temperature is the most pleasant for the fisherman. In the early season, this is midday; and nightfall and sunrise in the summer. This seems reasonable as a general rule since these are the times when the water temperature is probably the most suitable for the trout and for the aquatic organisms they feed on. How do weather conditions affect water temperature? Air temperature is the factor that most conditions water temperature. 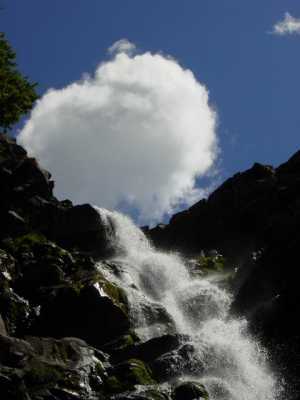 But other weather factors such as cloudiness, humidity, wind and precipitation also affect the temperature of the stream. For obvious reasons, trout don't feel humidity directly. So traditionally anglers haven't considered it important for fishing. Nevertheless, it affects water temperature and, as a result, trout activity. So it's a factor to reckon with after all. The water temperature in streams depends primarily on the temperature of the air. Rising temperature of the air generally increases the water temperature. For temperatures that are neither very high nor very low, the relationship between the water temperature and the air temperature can be considered linear. Nevertheless, when the air temperature reaches high values, the evaporation of the water in the stream starts to be considerable. Consequently, the effect of an increase in the air temperature is partially compensated by cooling due to evaporation. As air temperature continues to rise, the water temperature increases less and, at a certain point, it practically doesn't increase at all. In these cases of high temperatures, humidity plays a fundamental role. Evaporation is much more effective when the air is dry than when it's humid. So on torrid, humid days, the water temperature reaches significantly higher values (and therefore less favorable for trout activity) than equally torrid but dry days. What effect can a sudden cloudburst have and why? On a torrid summer day, a cloudburst can drive the water temperature down enough to awaken a seemingly lifeless stream to intense activity. This drop in temperature is due primarily to the cooling of the air produced by the evaporation of the rain as it falls through dry, warm air. To a lesser degree, it is also due to the rain directly cooling the surface water of the stream. Moreover, other factors may also favor trout activity. One example is the decrease in luminosity afforded by the storm. I've seen good hatches while it's snowing. How can you explain this? Sudden changes in the weather are frequent in spring. After several warm days have significantly increased the water temperature, a cold front may cause the air temperature to drop all of a sudden. Nevertheless, due to the inertia of water against temperature changes, the water can stay relatively warm (and therefore suitable for certain insects to hatch) even hours after it starts snowing. Wind favors the exchange of heat between the air and the water, tending to bring the water temperature up or down to that of the air. In turn, evaporation is more effective on windy days. This reinforces the cooling by evaporation, although its importance is less than that of humidity. You get up one morning with the intention of going fishing. You look out the window to see what the weather is like. Are there any weather conditions that would make you give up the idea because they're totally negative for trout activity? No. Fortunately all of the rules that relate weather conditions with trout activity are far from infallible. I feel this is an important part of the allure of fly fishing. What about those solunar tables so many fishermen consult? Solunar tables are the horoscopes of the fishing world. They're based on a supposed influence of the moon on living beings. Although science has proven the influence of the tides and the moon phases (due to the moon phases varying the illumination) on the biological cycles of some living beings, the solunar theory goes further. It postulates the existence of a direct, immediate influence of the position of the moon in the firmament on the animals. For this to be true, the only possibility would be that the gravitational force of the moon were capable of acting significantly on living beings, and this is not so. The gravitational attraction exerted by the moon is extremely weak. It's only noticeable when its accumulated effects act on enormous masses, as with the tides of the large oceans. Even in seas such as the Mediterranean, the tides are weak. And they are negligible in big lakes. So the effect it can have on a trout is simply ridiculous. The belief that the gravitational force of the moon can affect trout makes no sense and has no scientific basis at all.